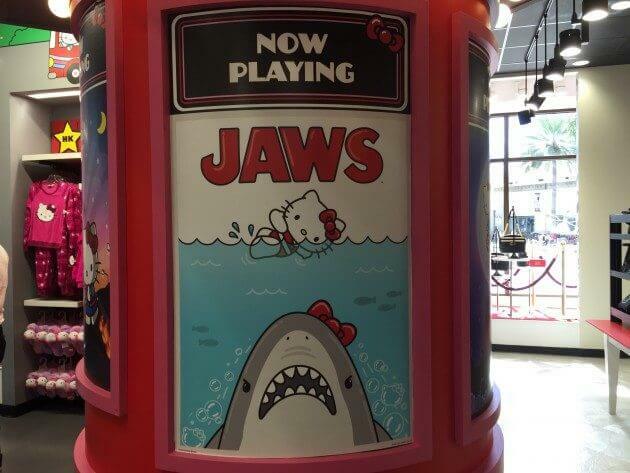 Hello Kitty debuted in Universal Studios Florida a couple of years ago. Highlights of the exclusive product offerings feature designs incorporating Sanrio characters into classic Universal titles such as “Jaws,” “E.T. The Extra -Terrestrial,” “Back to the Future” and more, as well as the group enjoying a variety of Universal Studios Hollywood theme park attractions, from the world-famous Studio Tour to “Jurassic Park—The Ride” and “King Kong 360 3D.” New park-exclusive merchandise will be released regularly. Hello Kitty will also make special appearances just outside the entrance of the Animation Studio Store. Making her Hollywood debut in a red pleated dress embellished with film strips. Hello Kitty will meet and greet fans near a collection of Sanrio-themed topiaries, including My Melody, Keroppi and Chococat, and window displays featuring the characters making movies and enjoying the Universal Studios Hollywood experience.